Wessex Archaeology has been employed by The Sherford Consortium to conduct and manage the archaeological investigations for the Sherford development site. A range of archaeological techniques have been employed, such as trial trench evaluation, watching brief and full excavation. An early geophysical survey of the site identified a number of areas of particular archaeological interest, and indicated where the archaeologists should start their investigations. The targeting of these areas has led to a number of significant discoveries being made, helping us to understand how people lived in this area – and used this landscape – in the past. So far, the excavations have demonstrated human occupation spanning some 4000 years. We will be carrying out further excavations at the site over the coming months, continuing to work closely with The Sherford Consortium, Devon County Council and consultants AECOM to ensure that the archaeological remains on the site are dealt with in an appropriate way, and to further help us understand of how this part of Devon has developed over time. Since Wessex Archaeology started investigating this site in early 2015, we have found a significant amount of evidence for prehistoric activity across the site. This includes several worked flints, some of which date to the Mesolithic (8500-4000 BC) and Neolithic (4000-2400 BC), indicating a level of human interaction with the landscape some 10,000 years ago. The remains of a Bronze Age (2200–700 BC) roundhouse was discovered on top of a hill on the southern edge of the site. This was in the form of the circular stone footings on which the timber structure would have rested. A feature in the centre of the house contained a large amount of Trevisker Ware pottery, a Middle Bronze Age style common in the south-west of England. The pieces represent large cooking pots decorated with fingertip and fingernail impressions, with some having deeply incised V-shaped motifs and unusual lug handles. Other finds of this date included Bronze Age cremation graves, some of which were grouped together in a ‘cemetery’. The cremated remains had been buried in a total of 15 pottery urns. Such a collection of urns is very rare for this part of the country, so these burials provide an important opportunity to learn how our ancestors here treated their dead several millennia ago. A large concentration of over 400 postholes and pits was found on another part of the site. Postholes indicate that there were originally structures in place, so these features suggest that there must have been several phases of settlement, stretching over a long period of time. The concentration was found on low ground to the west of an old river channel. We can assume that the focus of activity was based on the presence of water. We are currently analysing the evidence from our excavations to try and confirm what activities were being carried out here during the Bronze Age period. In February 2016, we had the rare opportunity to excavate an Early Bronze Age (2400–1500 BC) round barrow – a mound of earth and/or stone raised over a central burial. Although round barrows were built in every part of the country many have been destroyed, mainly by ploughing. However, the mound of this round barrow still partly survived, meaning that its excavation was the first of its kind for several years in this part of lowland Devon. The barrow was excavated by hand, starting with two opposing quadrants. This technique allowed us to look at how the mound had been built up using different materials, some of them dug out of a surrounding circular ditch, 28 m in diameter. Under the centre of the barrow we found a cremation burial placed in a pottery urn. To have been commemorated in such a spectacular way we can assume that whoever was buried in this grave was a person of some importance in the community. A number of other urned cremation burials were found on the periphery of the round barrow. These ‘satellite’ burials may have been relatives or descendants of the person buried in the central grave. A significant amount of Mesolithic and Neolithic worked flint was also found around the barrow, which suggests that this location had been used many thousands of years before the barrow was built. When the barrow finally went out of use, its ditch gradually filled up with eroded mound material, no doubt helped by later ploughing. Excavations of a second barrow located only 50 m to the north is currently underway. Keep an eye out for more information about these investigations. Discoveries from 2015 also included three roundhouses likely to have been inhabited during the Late Iron Age to early Romano-British period (100 BC to AD 400). The timbers houses, which would have been between 12 and 14 metres in diameter, had long since decayed, but they were identifiable by the remains of their drip gullies. These were small ditches cut around the outside of the houses to catch rainwater dripping off their conical thatched roofs and stop it from seeping inside. A decorated comb made from animal bone was found within one of the drip gullies, and is likely to have been used for weaving on a loom. Near the settlement we also found evidence of Romano-British burials. Although very little bone survived, items such as coffin nails and hobnails were found in the graves. In one case a complete shoe was identified in the form of over 40 hobnails. Excavations in 2016 revealed a strange but interesting feature cut into the natural limestone on top of a hill. It had partly destroyed a drip gully of one of the Late Iron Age/early Romano-British roundhouses (100 BC to AD 410), and so was clearly later in date. It appeared to have a ‘keyhole’ shape, but as excavation progressed it was shown to comprise a T-shaped stone-lined slot with a circular pit at its northern end, and outer stone walls built at a higher level. The slot walls and outer walls were bedded a yellow mortar. This identified the feature as a type of Romano-British structure commonly called a ‘corn-drying oven’, but which may also have had other uses. The pit at the bottom of the ‘T’ would have been the stokehole from where a fire would have been set in the mouth of the flue. The flue, which formed the stem of the ‘T’ and was roofed with four large stone slabs, up to 1.1 m wide, carried the heated air to the uncovered vent at the back (the bar of the ‘T’), so that it could circulate in the structure above, as defined by the outer walls. Some of the slabs had tooling marks from when the stone was quarried. Strangely, no evidence for a fire was detected, and its it possible that the structure was never used. Nonetheless, at some point is was abandoned, after which it had become infilled, perhaps helped by being used as a dump. The remains of a Romano-British pewter plate and a coin dating to the late 4th century AD were recovered at the base of the feature, along with a horse mandible. There was also a wide range of Romano-British pottery, including high-status wares such as samian and Black Burnished wares, and a large quantity of cereal remains, including barley and wheat. Several features dating to the medieval (AD 1066–1500) and post-medieval (AD 1500–1800) periods have also been recorded. Interesting medieval finds include a cut silver penny dated to the reign of Henry III. Later features include trackways associated with local limekilns at Gore Farm. A pair of limekilns survive in the area today in a disused limestone quarry and are likely to date from between 1750 and 1850. The kilns are located in woodland which is to be preserved within the development. We have also found evidence of remnant farm buildings, notably Gore Farm which was demolished in 1869, as well as former field boundaries which are depicted on early 19th-century maps of the area. Our study of the historic landscape allows us to understand how the landscape has changed over time, to understand historical processes and reasons that have shaped the Sherford of today. All of the information we are gathering add to our growing knowledge of how the agricultural landscape was used in more recent times. Before excavation began a detailed geophysical survey of the entire site was undertaken, allowing us to identify archaeological features and so giving us insight into the potential of the site before we started digging. A few features were even identifiable without geophysical survey as they were already visible in the wider landscape. The construction will impact upon below-ground archaeological remains where groundworks or landscaping will take place. In these cases, archaeological investigation is required. By gathering this information, we will seek to create a picture of how this landscape has changed over the last 4000 years, how it has been occupied, utilised and modified by the communities who have inhabited it. We can tell a lot about these past societies by the features we are excavating – the houses, ovens, ditches and graves – and by the finds we recover – their pottery, tools, weapons, clothing and personal adornments, even their human remains. And from the many samples of soil we are taking we will learn about their economy, agriculture, and their craft and industrial activities. Eventually, all of our findings will be brought together and published in books and so made accessible to all. The excavation that you can see in front of you is just one of several which will take place during the course of the development. We will continue to work closely with The Sherford Consortium, Devon County Council and consultants AECOM to ensure that the archaeological remains on the site are dealt with highly professional manner, to help everyone understand of the ancients roots and long history of this new community. The Sherford Consortium, the network of homebuilders responsible for the development of the Sherford new community, commissioned Wessex Archaeology in collaboration with AECOM to organise and host a community open day at the Sherford site. The objective was to allow the public and press to see the archaeological works in progress and through doing so add value to the new South Hams community, by generating understanding around how the landscape and peoples have changed over time and fostering a sense of place through shared heritage assets. Wessex Archaeology supported by AECOM, Plymouth Museum and Devon County Council delivered a community open day on site. The community open day enabled local residents to engage with the archaeological works and discover more about their local environment. Over 860 people attended the event where they were able to view the excavation area; talk to the site archaeologists; engage with Plymouth Museum’s display and for children there was the opportunity to take part in mini excavations. 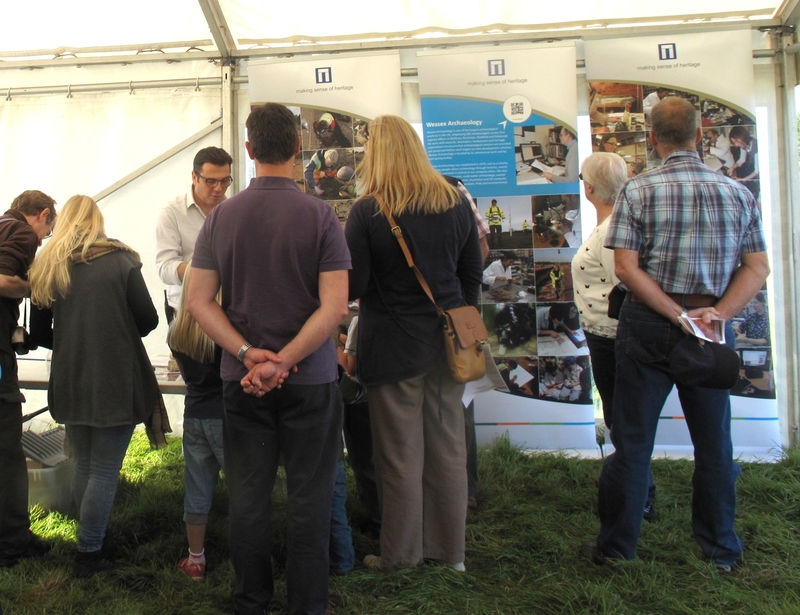 High quality display and promotional material were produced by Wessex Archaeology’s specialist graphics team for the event. These materials included information panels, leaflets, posters and a promotional flyer. In addition a project webpage was created on the Wessex Archaeology website and a successful social media strategy was implemented across several platforms. The community open day was positively received by the local community and the local media. The positive reception of the open day has reflected well on the Sherford Consortium and has therefore facilitated positive local engagement with the development.